Aimee Watkins (formerly Mason) will take over as captain of the New Zealand women's team following the retirement of Haidee Tiffen. Watkins, who was the vice-captain during the team's run to the World Cup final in Australia earlier this year, will lead New Zealand during the World Twenty20 in England in June. Watkins, 26, said she was proud to be given the captaincy of the national team. "Following on from Haidee is a big ask - but I know the team is going to be fully behind me," she said. "It's a big challenge but exciting at the same time. "I see one of my strengths as being a pretty calm sort of person - I'm not easily flustered. I hope to lead by example and by my performance on the field." New Zealand coach Gary Stead said Watkins was the logical choice as leader after Tiffen's retirement. "She has been in the vice-captaincy role on previous tours, including the 2009 World Cup, and has experience and a good understanding of the New Zealand women's team leadership and management group," he said. "Her aggressive style as a player makes her someone that can have a significant impact on the game - and the T20 style of cricket will be a great way for her to lead from the front." 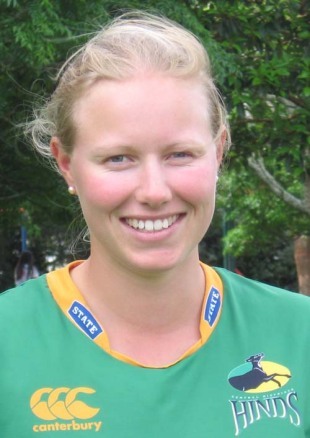 Watkins made her New Zealand debut in 2002, and has played 84 one-dayers and two Tests. She was the side's leading wicket-taker at the World Cup in February, bagging 11 scalps at 14.27.